Our Prepare for Impact app surpasses 5 Million downloads! Prepare for Impact is our serious game that reproduces the experience of real-world aircraft emergencies from the passenger's viewpoint. The app has today surpassed 5 million downloads (Android and iOS combined). The app was also covered by news sources such as TIME and Popular Mechanics. In a collaboration with neuroscientists, just published in the Neuropsychologia journal, we tested one of our VR emergency evacuation experiences in which users received a request for help from a seriously injured virtual human. Analysis of images of users' brains revealed that users who risked in the VR world to try to save the virtual human had enlarged right anterior insula (an area of the brain that is believed to play a role in empathy) than those who did not. The purpose of the DroneRules PRO project is to assist the drones industry in adjusting to new legislative requirements on privacy and data protection. Our HCI Lab will be in charge of all software development in the project consortium, that will deploy an advanced on-line course, blending e-learning and serious games. In a new paper in the Entertainment Computing journal, we define the genre of Existential Video Games, that is games which aim at encouraging existential reflection, dealing with human concerns such as death, isolation, and meaninglessness of life. The paper also carries out a study with 43 participants who were asked to play an existential video game. Results show that the video game effectively elicited reflections in the majority of players about their own mortality. The International Journal of Human-Computer Studies has just published the user evaluation of the EmoPaint app we created together with University of Zaragoza. The study reveals that the app is easy to use and able to detect user's emotions. Moreover, the app improves recognition accuracy of the considered set of 14 emotions over a traditional method (Affect Grid with Circumplex model). The EmoPaint app can be downloaded for Android and Apple devices. Our latest study, published by the Safety Science journal, shows that aviation safety knowledge acquired through smartphone-based 3D worlds transfers to the real world. Moreover, participants who learned from the mobile 3D world were faster and made much less errors in the real world than participants who studied traditional materials that described the procedure. In a user study published by the IEEE Transactions on Human-Machine Systems, we have compared different versions of mobile 3D maps. Users walked in a real, large, complex building, finding locations with the help of a smartphone app. 3D third-person perspective maps obtained better results than both 3D first-person perspective and traditional 2D maps. This week, Prof. Luca Chittaro gave a speech at the 16th European Airline Training Symposium (EATS 2017) about Cabin Safety Training Based on Mobile, Gaming and Virtual Reality Technologies. The Transportation Research journal has just published the controlled study in which we compared the Safety Briefing Card and Safety Briefing Video media in the aviation domain, showing that adding even a very basic level of interactivity to the Video media improves training effectiveness. We've just released EmoPaint - Paint Your Emotions!, a novel app for body sensation and emotion awareness, that we have created in collaboration with the University of Zaragoza (Spain). EmoPaint can be freely downloaded on Android and Apple devices. Australian Aviation Authority describes our Air Safety World as "perfect app"
In its flagship aviation safety magazine, CASA (the Civil Aviation Safety Authority of the Australian Government) has mentioned our Air Safety World as a "perfect app". Air Safety World makes passenger safety instructions clearer, more fun, and more effectively remembered by passengers. Air Safety World provides passengers with the world's first interactive airline safety briefings and lots of gamified flight safety experiences. Its user base is growing very rapidly (over 100,000 users just in the first 4 weeks), and the app is being covered by general media such as The Independent and Travel+Leisure as well as specialized aviation media. In a collaboration with neurophysiologists, we created the MotorBrain app to measure neuromotor performance with a smartphone. Our published study, nominated Editor's Choice by Computer Methods and Programs in Biomedicine, shows that the app is able to detect performance differences due to aging. In a paper just published by the International Journal of Human-Computer Studies, we study exposure to mortality cues in virtual reality experiences, showing that it has an effect on users' attitudes towards risk. A full copy of the paper can be downloaded from our web site. A multi-disciplinary collaboration with our lab showed that users of a virtual reality world who behaved altruistically towards virtual characters had a larger insula in the brain. The study has been published today by the Neuropsychologia journal. Our Prepare for Impact app surpasses ONE MILLION downloads in first 9 months! Prepare for Impact is a serious game that reproduces the experience of real-world aircraft emergencies from the passenger's viewpoint. It was published for Android and iOS in March 2016 and has surpassed 1 million downloads in its first 9 months. The app was also covered by news sources such as TIME and Popular Mechanics. In our latest study on mindfulness apps, we carried out a qualitative analysis with users over a 5-weeks usage period. The study, just published on the Interacting with Computers journal, indicates that several participants experienced decentering from their worries when using the app, and identifies new design opportunities for mindfulness apps. How are mindfulness meditators affected by Virtual Reality? Our lab has carried out the first study about how mindfulness meditators differ from non-meditators in perceiving virtual reality experiences. The results, published by the Computers in Human Behavior journal, show that midfulness meditators are much less affected by virtual reality: physiological measurements as well as their questionnaires after exposure to scary virtual experiences indicate an emotional deactivation that was not found instead in non-meditators. HCI Lab releases the Unity source code for its automatic viewpoint computation library, described in this IEEE TVCG paper, and employed in one of our aviation safety applications. The library is available at this Github repository. Head of our lab is co-editor of the special issue on "Interactive Persuasive Systems" of the International Journal of Human-Computer Interaction. The special issue focuses on design and evaluation aspects, with a special emphasis on the ways persuasion concepts and theories are exploited, adapted or augmented in interactive systems. Today, we published a web site that illustrates our research on safety for aircraft passengers. The web site also includes demos and videos of some of the apps we developed. In a paper just published by the International Journal of Human-Computer Studies, we study what 2997 users did in the 4 weeks after downloading a mobile mindfulness app from on-line stores. A full copy of the paper can be downloaded from our web site. Two of our lab members have written a comprehensive introduction to this topic that has been just published by IEEE Computer. You can download the full paper here. The Association for Computing Machinery (ACM) is the world's largest educational and scientific computing society. ACM's Distinguished Speaker program provides universities, corporations, and agencies direct access to top technology leaders and innovators from the computing industry. In a study just published by the Computers in Human Behavior journal, we explored video games as terror attack preparedness materials for the general public. In addition to showing that playing a serious game greatly increased players' knowledge about preparedness, our research showed that passively watching someone else play the game was as effective as actively playing it in terms of learning preparedness knowledge. The difference between the two conditions concerned psychological effects on threat appraisal: perception of personal vulnerability to terror attacks and their severity increased more in those who actively played the game. The US CDC includes one of our papers in its list of "publications with particular relevance". The included paper concerns serious games for terror attack preparedness. The CDC list can be downloaded at this link. Our full paper can be downloaded from our web site. In a new paper published by the Computers & Graphics journal, we describe our real-time, automatic camera control system that exploits AI techniques to model abilities typical of the camera operator (choosing proper camera positions and angle to shoot some events) and the director (review shots and edit them). This video shows how the system can respond to user's requests by automatically producing different movies of the same simulation of a full Airbus 320 evacuation. The first report, aired on May 3rd, illustrated three of our recent aviation safety apps. In the second report, aired on May 4th, the hosts of Fox & Friends tried live our free Learn to Brace app. In a report titled "Total Recall", Discovery Channel has illustrated today the results of our experiment on VR and memory retention, published in a scientific paper on the IEEE Transactions on Visualization and Computer Graphics. Our experiment has shown that using a virtual reality headset to experience risky situations as immersive 3D games improves memory retention of passenger safety instructions. The Discovery Channel report has also showed the Oculus Rift version of the risk experience we have just released. Released for the Oculus Rift and downloadable from Oculus Share, the Emerging Water Landing VR (see video) app allows users to live an immersive experience of an airliner water landing and evacuation. Players can interactively try possible right or wrong passenger's actions and see their effects simulated. In a research carried out in collaboration with a group of psychologists, we studied how victim ethnicity and different types of virtual reality emergencies affect user's behavior. Results are described in a paper that has just been published by the Computers in Human Behavior journal. Today we have launched our new Life Vest app, freely available for all major smartphone and tablet platforms (Android, Apple, Windows Mobile). In three different game levels, you interact with the game character to make it wear the life vest properly and to jump out of the plane alive. You can also face time challenges and compare your results with those of other players. The 3D model of the life vest is a high-fidelity reproduction of a real vest used by many airlines. Our laboratory has conducted a study on anxiety induction in Virtual Reality, showing that the exploitation of auditory heartbeat biofeedback is an effective technique for generating anxiety in users. These results appear in a paper that has just been published by the Interacting with Computers journal. It has also been featured in the Science section of Slashdot. Hundreds of mobile apps for breathing training are available in on-line stores but no one had evaluated their effectiveness so far. Our lab has thus conducted a study of a mobile breathing training app focusing on users’ physiological parameters as well as subjective perception. Results show how different graphical representations of the breathing process can contribute to the effectiveness of the app. These results have been collected in a paper that has just been published by the Computers in Human Behavior journal. The fMRI brain study of one of our Virtual Reality experiences that simulates life-threatening situations has been published by NeuroImage, a top neuroscience journal. The experience requires users to survive a serious fire emergency in a building, and puts them in a situation in which they have to choose between saving a virtual character trapped under a heavy cabinet or reaching the exit of the building. The results of the paper show differences in brain activity between users who escaped the building and users who helped the virtual character. These results have been featured on Wired as well as the Science section of Slashdot. The International Journal of Human-Computer Studies has just published our recent evaluation of different virtual character control systems based on user's physiology (read the news) that highlights the importance of including a Placebo condition in Affective Computing studies. Our paper has been featured on the Science section of Slashdot. We have conducted a laboratory study to evaluate different methods to control the behavior of a virtual character through user’s physiological signals in a game for relaxation training (see video). The character control system has been featured on popular Web sites like Rock-Paper-Shotgun and the Games section of Slashdot. This week our lab has released the Learn to Brace app for all major mobile and desktop operating systems. This first public game for aircraft passengers' safety is generating a lot of interest, and the news is being discusses on several popular Web sites, including Gizmodo, Slashdot and Fark. The speech on technostress by our lab director is now available on TED.com. You can watch it here. Our lab is the first to conduct a laboratory study of the effectiveness of mindfulness apps. The paper has been published by the International Journal of Human-Computer Studies and shows that the studied app is more effective than traditional non-interactive methods on a sample of novice meditators. Jeffrey Kluger, Editor at Large for TIME, the weekly news magazine with the largest world's circulation, reflects about the implications of the virtual reality experiment that took place at our lab in cooperation with SISSA Social Neuroscience Lab. His article can be read from TIME website, while the technical description of the experiment is at this link. Social Neuroscience publishes a virtual reality experiment carried out at our lab. The study reproduced critical situations in which user's actions lead to the death of virtual humans (see video). The paper shows that user's behavior in virtual reality becomes more utilitarian with respect to the traditional, less realistic ways of presenting such dilemmas in moral psychology research. Time perspective and problematic Internet use in Facebook users. A study conducted by our lab has linked specific attitudes towards time (Past Negative and Present Fatalistic) of Facebook users with their level of Problematic Internet Use. The results are described in a paper that has just appeared in the Personality and Individual Differences Journal. New physiological measures for affective computing. In a paper presented today at the 5th International Conference on Affective Computing and Intelligent Interaction (ACII 2013), our lab explores if eye-blink startle response, as a measure of stress and negative emotions, could be used in affective computing. We show that eye-blink startle response can be elicited using natural sounds and exploited in interactive applications such as 3D virtual environments. Our lab completes a thorough study about using 3D serious games in a real medical emergency course. The game concerns Advanced Life Support (ALS) and is used to train nurses and doctors. The study has been published by one of the top international journals in Medical Informatics. You can download a copy of the paper at this link. Navigation of 3D virtual environments by autistic children. Working with a multidisciplinary team, our lab explored how autistic and non-autistic children navigate 3D virtual environments. The results of the study have just appeared in the international journal Research in Autism Spectrum Disorders and you can download the paper at this link. Our lab receives Best Paper Award from Pervasive Health. Our lab received today the Best Paper Award from Pervasive Health 2013, the 7th International Conference on Pervasive Computing Technologies for Healthcare. The awarded paper proposes and evaluates a novel mobile exergame based on Digital Audio Storytelling. Our lab releases the first open-source viewpoint computation library. The C++ library computes the best viewpoint in a 3D scene to satisfy a set of visual properties, such as size, visibility or angle of selected objects in the scene. It makes no assumptions on the scene and objects, and returns a result in pre-defined time for usage in interactive applications. Physiological evaluation of mobile video games. A recent psychophysiological study conducted in our lab has focused on mobile Whac-a-Mole games, investigating user experience as well as desensitization to violence aspects. A journal paper about the study has just appeared and you can download it at this link. Improving mobile apps with Overview+Detail interfaces. The lack of screen space on mobile devices requires app designers to adopt more sophisticated user interfaces to manage large information spaces. In a new paper that has just been published by the Personal and Ubiquitous Computing journal, we provide a thorough introduction to Overview+Detail interfaces, and illustrate an experiment that advances knowledge about their design space. Our lab presents two papers at the MOBILE HCI 2012 International Conference. The first presentation was a full conference paper about the visualization of large numbers of off-screen objects on mobile devices, while the second was a workshop paper about a study with disabled students to assess their needs with respect to navigation and information services in university buildings. Head of our lab receives Best Paper Award. Luca Chittaro received today the Best Paper Award at the 7th International Conference on Persuasive Technology in Sweden. The awarded paper illustrates how to educate airline passengers about aviation safety using video games. HCI Lab presents iPhone mobile exergame that encourages walking. We have turned the classic Snake game into a mobile exergame in which the player controls the snake by walking in outdoors playing fields. Today we have released a video and a technical paper about the game. HCI Lab invited to present at national conference on Non-Conventional Emergencies. More than 200 members of first response forces (emergency medical responders, firefighters, civil defense, police, military,...) attended the meeting, and our presentation illustrated the virtual reality systems and serious games we are developing for training. HCI Lab invited to present at National Fire Corps event in Assisi. The theme of the National Fire Corps meeting concerned how to help people with disabilities in emergency situations, and our presentation illustrated the different systems we are developing to that purpose. Studying natural user interfaces with Electromyography (EMG). People like "natural" interaction with computers and games but what are its effects on the muscular system? We begin to shed light on this scarcely explored aspect of natural interfaces with a detailed EMG study which will appear in the March Issue of the International Journal of Human-Computer Studies. We analyzed users' muscle activity in pointing activities with the Wii controller and compared it with traditional mouse and keyboard interaction. The Director's Lens: a smart assistant for shooting CG movies. A research from our Lab, together with international partners (INRIA Rennes, France, and Millsaps College, USA), has been presented at ACM Multimedia 2011 and ParisFX conferences. The research concerns a smart assistant for shooting CG movies that combines manual and automatic camera control. You can read a brief description of it here and the full technical description here. HCI Lab becomes an associate member of V-MusT. Our lab has joined V-MusT, the EU FP7-funded network of excellence that aims to provide the heritage sector with the tools and support to develop virtual museums that are educational, enjoyable, long-lasting and easy to maintain. Web-based personal medical records offer new opportunities for providing patients with personalized care. In the last years, we have built PRESYDIUM, a system that stores user models of disabled patients and uses them to support emergency medical services in the field by providing information and procedures tailored to the specific patient. Read all about it in a paper that has just appeared in the User Modeling and User-Adapted Interaction (UMUAI) Journal. Virtual Reality and Autistic Children. Our lab has joined a multidisciplinary team (integrating expertise from computer science, pedagogy, psychology and psychiatry) to explore the design of virtual reality applications that can be used by autistic children for education and training purposes. For a quick introduction to the research topic, you can read the state of the art we wrote for the Epidemiology and Psychiatric Sciences journal published by Cambridge University Press. Navigating when GPS signal is bad. Our lab has presented today a full paper at the MOBILE HCI 2011 International Conference about how mobile navigation apps can visualize the uncertainty of GPS positioning. The conference selection process was very strict and only 63 full papers and notes (23%) were accepted out of 276 submissions received. Luca Chittaro gives invited tutorial on Mobile App Design at ACM EICS 2011. The director of our lab presented the tutorial today at the ACM International Symposium on Engineering Interactive Computing Systems. The speech dealt with how to build effective interfaces for mobile apps, with a particular focus on visual aspects. Facing lack of screen space in mobile visualizations. When navigating large information spaces on mobile devices, the small size of the display often causes important content to shift off-screen, greatly increasing difficulty of use. We have thoroughly tested three different techniques to face this problem. Read about our findings in the paper that has just appeared in the Interacting with Computers journal. 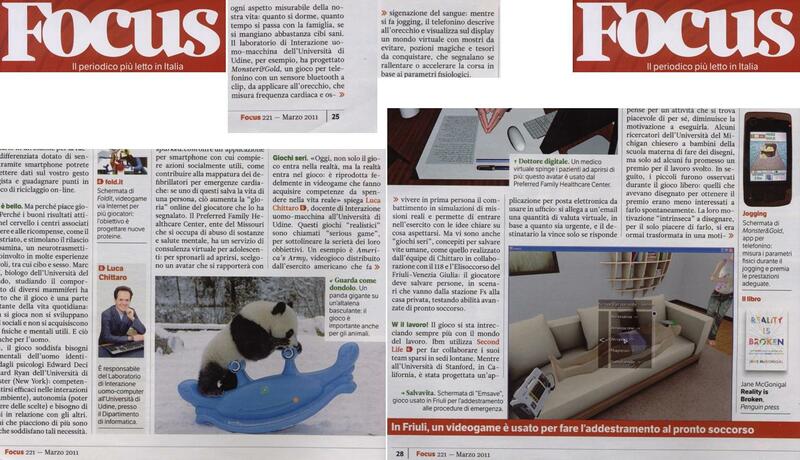 The most read magazine in Italy (Focus) devotes an article to our research on serious games. In a long article in its March issue, Focus (the most read magazine in Italy) presented some of the results of our research on Serious Games and Training: the EMSAVE system for training medical first responders and the Monster&Gold mobile game for fitness training. Context-aware fitness games for mobile phones. Our latest mobile fitness game employs sensors that detect user's speed and heart rate and adapt gameplay to maximize cardiovascular benefits. Read all about it in the journal paper that has been published by IEEE Pervasive and watch the video demo. HCI Lab releases a public demo of VEX, a 3D software for designing virtual visits and exhibitions. Head on to the download page, try the software, and let us know what you think! HCI Lab presents its new tool for virtual exhibition design at Le Louvre in Paris. The presentation took place in the context of the 11th VAST International Symposium on Virtual Reality, Archaeology and Cultural Heritage, which selected our contribution as a full paper. Our lab presents two papers at the MOBILE HCI 2010 International Conference. The conference selection process was so strict that only 17% of short papers submissions and only 23% of full papers submissions were accepted. Our two papers deal respectively with communication between medical responders and deaf persons and menu selection for blind users on mobile devices. Our lab presented two papers at Smart Graphics 2010 in Canada. The topics respectively concern a tool to easily design 3D virtual exhibitions and walkthroughs and a language to express and evaluate visual properties of virtual cameras in 3D worlds. This week, at the Persuasive 2010 International Conference in Copenhagen, Denmark, we have presented our accepted full paper that shows how Virtual Reality can be an effective tool to induce emotions (including anxiety) and change people attitudes towards personal safety topics. The conference selection process was very strict leading to the acceptance of less than a third of the 80 submitted papers. Designing multimodal interfaces for mobile devices. Future interfaces of phones and other mobile devices will be increasingly multimodal. Read Luca Chittaro's introduction and advice on mobile multimodal interfaces in the invited paper just published by Springer's Journal on Multimodal User Interfaces. HCI Lab receives honorary mention at the IEEE Conference on Games for Serious Applications. Our serious game for training medical first responders received the honorary mention as one of the three best full papers of the international conference IEEE VS-GAMES 2010. Easily arranging 3D objects in virtual worlds. Today, at the ACM VRST 2009 Symposium, our lab presents a full paper on the effectiveness of combining a first person and a map view in 3D object arrangement tasks. Our work is one of the 21 full-papers accepted by the conference out of 61 submitted. The director of our lab gives invited tutorial on Mobile Visualization at Mobile HCI 2009. Luca Chittaro presented the tutorial today at the Mobile HCI 2009 international conference in Bonn. The speech dealt with how to build effective visual interfaces on mobile devices and the slides have been made available on the Web. Our lab has presented two papers at the UMAP 2009 International Conference. The conference selection process was strict leading to the acceptance of only 47 research papers out of 125 submitted. Our two papers deal respectively with user modeling of disabled persons for improving emergency medical services and filtering of fitness trail content generated by mobile users. Luca Chittaro delivers keynote speech at IEEE HSI 2009. The director of our lab gave today the keynote speech at the international IEEE conference on Human-System Interaction. The topic of the speech concerned the role of visualization in mobile human-computer interaction. The director of our lab gives keynote speech on Multimodality in the Mobile Context. Luca Chittaro gave the speech today at the international event on Challenges of Engineering Multimodal Interaction, held at the Fraunhofer Institute for Applied Information Technology in Germany. The speech discussed challenges and opportunities for multimodality on mobile devices. Luca Chittaro is invited speaker for the ENEL "Meet the Scientists" initiative. ENEL is Italy’s largest power company, and Europe’s second listed utility by installed capacity. The event took place today in the city of Livorno. The invited speech dealt with human-computer interaction and computer-mediated communication. Our lab heads large project on advanced emergency medical services for the disabled. Today we made available a web site where you can read about the goals, partners, results of the project, and get the first publications. Two (out of 21) full papers accepted by IEEE VS-GAMES 2009 are from our Lab. The First International IEEE Conference in Serious Games will be held this month in the UK, and the two papers we will be presenting concern respectively a serious game for personal fire safety training and task modeling in serious game design for medical first responders. Luca Chittaro delivers keynote speech at IFIP World Computer Congress. The director of our lab is one of the keynote speakers of the 20th World Computer Congress organized by IFIP. The congress was attended by 2000 participants from 70 countries. The topic of the speech concerned Interaction with Visual Interfaces on Mobile Devices. Our lab presents two different papers at the MOBILE HCI 2008 International Conference. The conference selection process was very strict leading to the acceptance of less than a third of the 210 submitted papers. Our two papers deal respectively with web/map navigation and 3D evacuation instructions on mobile devices. Evacuation support based on location-aware 3D maps. Last week, at the Mobile Response symposium in Bonn, Germany, we presented our mobile system that supports the user in the evacuation of buildings. The system provides the user with evacuation instructions by using 3D representations of the building and determines the position of the user in the building by employing active RFID technology. Maps and web page navigation on mobile devices. Recently, we have investigated a few techniques that support user navigation of maps and web pages on small-screen devices. Read about our findings in the paper that has just appeared in the International Journal of Human-Computer Studies. Wearable Systems for Outdoor Fitness Training. Our lab has proposed a context-aware and user-adaptive wearable system for outdoor fitness training, which exploits position and physiological sensors as well as a 3D virtual trainer to provide users with tailored advice and exercises. You can read the details in the paper that has just appeared in the Artificial Intelligence in Medicine journal, Special issue on Wearable Computing and Artificial Intelligence for Healthcare Applications. Interactive visual analysis of geographic data on mobile devices. Geographic data is often crucial to support users' activities in the field. Our lab has developed a highly interactive interface based on visual dynamic queries that allows users to manage geographic data on mobile devices. Read all about it in the paper that has just appeared in the Journal of Visual Languages and Computing. Visual analysis of users' mobile browsing behaviors. Our lab has developed a system that visually highlights various aspects of how users browse an information space on a mobile device. You can read in detail about it in the paper published by IEEE Computer Graphics and Applications, and chosen by the magazine as its January/February 2008 Highlight. Navigation support and user differences in 3D Virtual Environments. In a paper that has just appeared in the International Journal of Human-Computer Studies, we have studied some new navigation aids for 3D Virtual Environments as well as the effects of past user experience with 3D environments on the effectiveness of these aids. Adaptive 3D Educational Virtual Enviroments. Our lab has developed a system, based on a well-known adaptive hypermedia framework, able to create a 3D virtual environment that selects and personalize interactive learning content for users. You can read in detail about it in the paper that has just appeared in the IEEE Intelligent Systems magazine, Special issue on Intelligent Educational Systems. Videogames that adapt to your heart rate. Last week, at the Smartgraphics symposium in Kyoto, Japan, we have presented our videogame architecture that adapts to the player's heart rate (see the video). The system has generated a lot of interest, and the news is being featured by lots of popular Web sites, including Engadget, Wired, Joystiq, The Feed, and many others. HCI Lab faculty edit special issue on "Web 3D Technologies for Learning, Education and Training". Luca Chittaro and Roberto Ranon are guest editors of the special issue of the Computers & Education journal on the different aspects of using Web 3D technologies for building learning, educational and training applications. The new Web: 3D, Adaptive, Mobile and Spatial. Read all about state-of-the-art solutions and technologies for creating new Web applications that include 3D, Adaptive and Map-based features in two different invited textbook chapters written by HCI Lab members. One is about Adaptive 3D Web Sites and the other about map-based applications for mobile devices. Visual analysis of people's movements. Our lab has developed a system that traces, visualizes and provides insights on users' movements in virtual as well as real places. You can read in detail about it in the paper that has just appeared in the IEEE Transactions on Visualization and Computer Graphics, Special issue on Visual Analytics. The major italian financial newspaper devotes a long article to our MOPET project. In a long article, the Sole 24 Ore newspaper presented today MOPET (Mobile Personal Trainer), our innovative mobile application that assists and guides users in outdoor fitness trails, monitoring life parameters through wireless sensors and teaching fitness exercises by means of a 3D character. Two (out of 20) full papers presented at the MOBILE HCI 2006 International Conference are from our Lab. The conference selection process was very strict leading to the acceptance of only 24% of the submitted full papers. One of our two papers is about mobile fitness applications, the other is about visualizing off-screen objects on mobile. Head of our lab on italian national TV. Luca Chittaro was invited by national channel RAI 2 to present our mobile guides project on a major live show ("Piazza Grande"), where he was interviewed by popular TV host Giancarlo Magalli. Watch the "Visualization in a Mobile World" broadcast on IEE TV. The keynote speech given by Luca Chittaro at IEE ICCSA 2006 in Glasgow can now be freely watched on the IET TV on-line television service. We have applied advanced Virtual Reality and simulation techniques to reproduce the effects of the 1976 earthquake that hit the Friuli region in Italy. The project also produced a movie that you can watch on the Web. HCI Lab releases new 3D software for free download. H-Animator is a visual tool for easily modeling animations of virtual humans based on the X3D and H-Anim standards. MobiX3D Player is a software for displaying interactive X3D content on PDAs. Visualizing information on mobile devices. Luca Chittaro writes the first introductory paper about this new exciting topic and is chosen for the Cover Feature of the March issue of IEEE Computer, the flagship magazine of the IEEE Computer Society. HCI Lab launches the new version of its mobile guide at BIT 2006. BIT (International Tourism Exchange) is the world's largest exhibition of Italian products and services for the travel industry, and attracts over 150'000 visitors from about 100 countries every year. The new version of our mobile tourist guide is now available for mobile phones as well as PDAs. Head of our lab interviewed by BusinessWeek. BusinessWeek is the world's largest business magazine. Luca Chittaro was among the experts interviewed for an article about the user's experience in e-commerce. HCI Lab at SMAU 2005. We showcased some of our projects at the 42nd International Exhibition of ICT & Consumer Electronics, that this year attracted 170000 visitors. Our free immersive simulator of the Frecce Tricolori jet and our mobile guide received significant attention and were featured on TV and newspapers reports about the Exhibition. A successful presence of our Lab at INTERACT 2005, with 3 full papers accepted. The conference is one of the most important and selective HCI events in the world: this year, only 70 full papers have been accepted out of 264 submitted. We will be presenting our latest work on mobile input, mobile guides, and visualization of navigation. Learn to fly an aerobatic jet with our free MB-339 PAN package. In a joint press conference with Frecce Tricolori (the aerobatic team of the Italian Air Force), the HCI Lab released today a free multi-platform simulation that allows you to learn flying their jet. Watch the video and the screenshots. HCI Lab students place 1st at the Imagine Cup 2005 italian finals. They will represent Italy in the Software Design category at the world finals in Yokohama, Japan, this summer. The Imagine Cup is a Microsoft-sponsored technology competition to let developers showcase their innovation. Our winning students presented a project called TellMe that integrates mobile and 3D technologies to assist users with certain disabilities in communicating. BBC News reports about one of our projects. In a news story about Web3D, BBC News mentions a project by University of Udine in Italy in which visitors to the city can use their own portable digital-capable machines to download 3D graphics of tourist sites. Two (out of 18) papers accepted at the ACM Web3D 2005 Symposium are from our Lab. One paper is about controlling humanoid characters, the other is about location-aware 3D visualization on mobile devices. Only 3 (out of 95) projects were selected in the regional contest. Our project is named Mobile 3D and includes a detailed business plan for a spin-off company that would deal with innovative exploitation of 3D graphics and mobile devices for tourist support. LET-Web3D Workshop to be held in Udine. The HCI Lab announces the first edition of the Web3D Workshop in Learning, Education and Training, that will be held in Udine September 30-October 1, 2004. For more information, visit the LET-Web3D website. We developed a system to give personality traits to 3D virtual characters and make them behave accordingly (as human beings do). The work has been accepted among the very best papers (22% rate of acceptance) of Computer Animation & Social Agents (CASA) 2004 Conference and published in the Computer Animation and Virtual Worlds Journal. Two (out of 22) full papers accepted at the Advanced Visual Interfaces (AVI) 2004 Conference are from our Lab. They deal with different HCI aspects of 3D Virtual Environments: one is about studying users' behaviours in 3D spaces, the other is about navigations aids. HCI Lab helps clinicians in the analysis of medical data. In the last three years, we have worked closely with clinicians to develop a visual data mining system that visualizes large temporal databases in a hemodialysis center. Some of the latest developments of this project are described in the special issue on Visual Data Mining of the Journal of Visual Languages and Computing. Mobile HCI 2003 (organized by our lab) concludes successfully. With 122 papers submitted from 26 different countries, and a selection rate of 33% for full papers and 49% for short papers, the fifth edition of the conference featured a very high quality technical program. Fly with the Italian aerobatic team in our latest Web3D production. In a joint press conference with Frecce Tricolori (the aerobatic team of the Italian Air Force), the HCI Lab launched today a 3D Web site that puts you on their jets while they perform amazing aerobatic manouvres. Two (out of 18) papers accepted at the ACM Web3D 2003 Symposium are from our Lab. One paper is about cloth simulation, the other is about intelligent characters. The HCI Lab presents a product at SMAU. The product is a Computer Supported Cooperative Work system for x-ray cristallography experiments, developed in cooperation with Elettra Synchrotron Light Laboratory, Trieste. Mobile HCI 2003 to be held in Udine. The HCI Lab announces the fifth edition of the Mobile HCI Conference, that will be held in Udine in September 2003. For more information, visit the Mobile HCI 2003 web site. The new Web site of the HCI Lab is on line.